Villa Grande Azure offers five bedrooms with their en suite bathrooms. four bedrooms have an interior access and the fifth one is in an independent bungalow with kitchen. Three bedrooms are on the pool level. The living space offers an extraordinary volume for the very well equipped kitchen (two fridges, two top stoves, two ovens), the living room and the interior dining room. 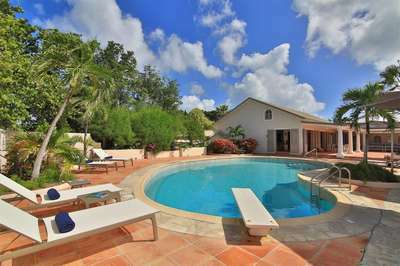 Villa Grande Azure is a very unique property in St Martin and you will never forget your stay on our beautiful island.